The Egyptian Presidency has refuted press reports claiming that Russia and Egypt are close to reaching an agreement for the establishment of a military base in the North African country. The news was reported by Russian newspaper, Izvestia, citing diplomatic and military sources. The Presidency Spokesperson Alaa Youssef said there are no plans to allow a foreign country to have a military base on the Egyptian territory. A military source added that welcoming foreign military bases in the country is against the government’s principles. Izvestia reported that discussions between the authorities were centered on leasing military facilities to Russia and an air base in Sidi Barani, a town 95km east of the border from Libya. The report added that if the two countries reached an agreement, the base could be operational by 2019. The Soviet Union had, before its disintegration, a naval facility near the Sidi Barrani until 1972 and it was used to monitor US naval forces deployed to the region. Egypt under President Sisi has developed close ties with Russia and last month, an offensive missile corvette was given as a gift to Cairo. Their navies also had their first ever joint naval drill in 2015 off the coast of Alexandria. The exercise lasted for eight days. Military ties between the two countries have been strengthening as Cairo tries to diversify its military artillery that used to heavily depend on American supplies. 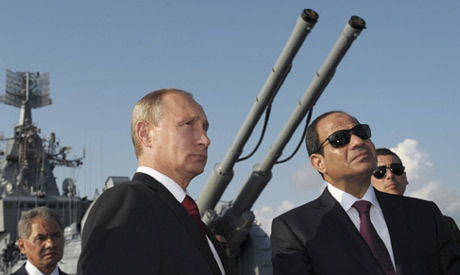 Earlier this year, Sisi approved $25 billion loan from Russia to build a nuclear power plant. The fostering of their relationship was slowed by last year’s crash of a Russian plane that killed all 224 people on board, mostly Russians. Written by: Jaber Ali on October 11, 2016. Posted by Jaber Ali on Oct 11 2016. Filed under Headlines, World News. You can follow any responses to this entry through the RSS 2.0. Both comments and pings are currently closed.